Yesterday evening, I made a double batch of a new recipe; I had decided that this year, I wanted to try more new things, ESPECIALLY the "fiddly" stuff I'm always passing up because I decide they can't possibly be worth all the huff and bother. BUT. The Food Altar at work has been even more neglected than my blog these last couple months. And I have lost THREE entire patches of "crops" (is a 20 x 15 patch enough to warrant the word "crop"?). Possibly it is just coincidence, sure...or the fact that I do not have the available time to apply the organic pest control methods of hand-picking the varmints off my fields, or washing their leaves plant by plant with anti-chewing-varmint soap. But MAYBE, the Food Gods are irked with me for not honoring them by plonking baked goods onto the Food Altar for my team to share. Which is why I made a double batch of apple bread - a cardoman-scented yeast bread with thin slices of cinnamon-sugar coated apples tucked into it. One entire loaf vanished before it was even cool enough to touch with bare fingers, one is in the fridge at home for Denizen breakfasts, and the other two are on the Food Altar to appease the Food Gods and feed my team. Also, I'm on the pointy, knitted-on border of the Spirit of the Southwest shawl. These knitted on borders are such a psych..."Yay! I'm done, the last row, row 202 at last, all 393 stitches of it, wooooo hooooooooo, now I just need to...knit these 24 fiddly rows...about....800 times...at thirty minutes per pattern repeat....(sob)..."
(but it's awfully pretty...I'll forgive it in the end..."
How you manage everything in your life just amazes me. The bread looks yummy! You tackle intricate knitting, garden to feed a family, etc.etc.etc. Wow! Surely your Oldest Denizen could be trusted with a spray bottle of Safer soap insecticide? Or offer a bug bounty? Sounds and looks yummy. No wonder you made a double batch. Any chance of a copy of the recipe? Also, when it comes to slugs/snails, have you tried copper barrier tape? It forms a chemical reaction with their slime and electrocutes them when they try to cross it. Would work on the raised beds, together with a watering of nematodes to kill the ones already in the bed. 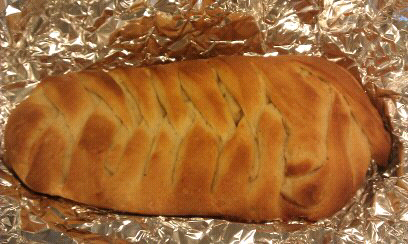 The bread looks delicious! 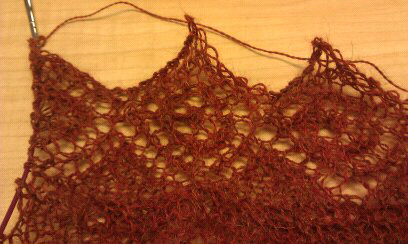 And the lace is beautiful. Sluggo is a great slug bait, and it's nontoxic and biodegradable. Shot of phosphorus & iron, plus dead slugs! Score. Do you know what is eating your plants? Knowing what the problem is really helps in finding the right solution. I'd pop for a $50 soil test, too, to find out if your soil is deficient in any particular mineral(s) and what the soil pH is. Best $50 to be spent, as it eliminates a lot of problems.